Much like Xerox has cornered the market on “photocopy” and Kleenex has taken over for tissue, marshmallow Peeps are synonymous with pink or yellow sugar-coated Easter bunnies or chicks. They just are. So when I see bright orange Jack-O-Lantern Peeps in the store (still strangely in the shape of bunnies..hmmm) it throws me off a little. I checked out the surprisingly awesome Peeps Web site only to discover that pretty much every holiday has an icon that can be sugar-coated and marshmallow-a-fied (hearts for Valentine’s Day, snowmen for Christmas, yadda to the yadda). But in my mind, Peeps only seem truly fitting for Easter. Anyone disagree? Let me know in the comments along with the answers to the following Peep quiz. 3. What year were the first Peeps created? 4. How long does it take to make one Peep? 5. Just Born Confections, the makers of Peeps, also makes what candy? 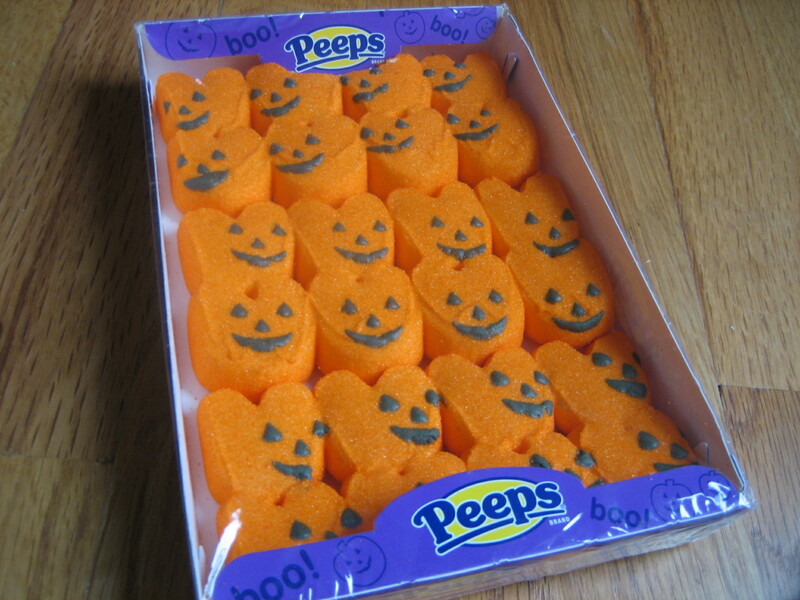 Peeps are food? I thought they were just toys to play with in the microwave.